The band founded nearly 20 years ago, just finished an European Summer Tour, performing in Holland, France, Italy, Slovenia, Switzerland, Czech Republic, Croatia and Germany. Leaded by piano star and Cuban musician of the year Manolito Simonet, is one of the world's most outstanding salsa groups. Combining cuban tradition perfectly with modern influences, the 16 musicians a large repertoire of some of the most well known salsa hits ever, like 'Marcando la distancia', 'El águila', 'Locos por mi Habana' or 'Loco por tus besos'. 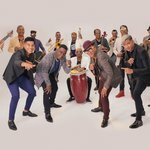 The live repertoire includes songs of their new album - 'Trabuco una vez mas' - powerful, highly danceable and with the Top Song 'Palabras'! Simply best contemporary Cuban music!